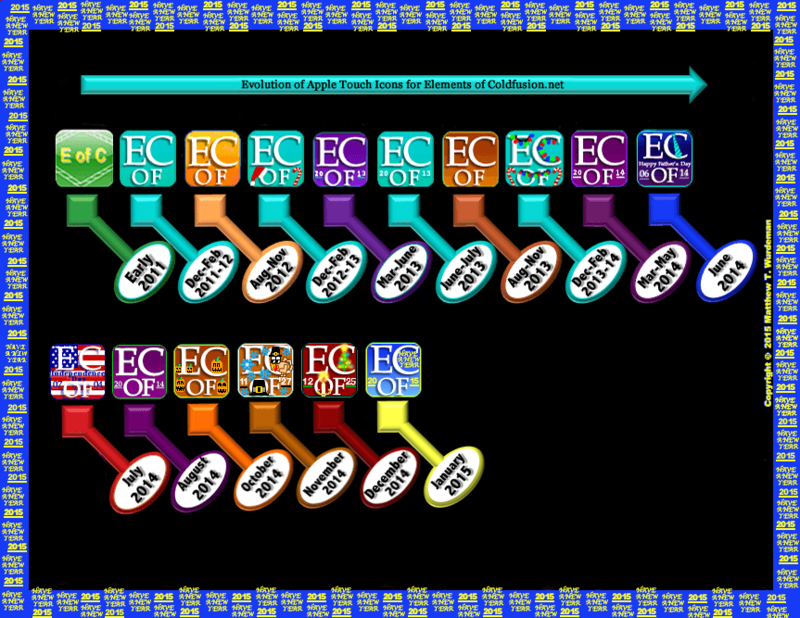 Screenshot of design progression and evolution of Elements of Coldfusion.net “Apple Touch Icons” by month and year. The image above provides a new look at the progression and evolution of Apple Touch & Android smartphone/tablet formatted icons. The image above represents a web designers point of view as well as a point of view that represents a specific web site brand & design identity. Indeed, the future of these type of icons could include the trend of uploading new design version for certain important holidays, seasons, etc. I think the idea of changing the theme without changing the overall brand and identity of the icons is the key in regards to what my designs were trying to accomplish. I think the main idea is that the “E of C” background theme, which I have encased and created a timeline for in this case, can be changed to fit more of the “Ui Novelty” to this new design paradigm I have created. Note: Please Click on the image above to expand view of icon progression. For Father’s Day, I decided to add a new Apple Touch & Android smartphone/tablet formatted home screen icon to my icon progression/timeline. I tried to stay in the design genre of the Google’s main “Google Doodle” without the use of animations or interactivity in this case. It would be rather difficult to do based on the fact that these icons are designed for the home screen of a smart phone or tablet device, so interactvity is not available for either Apple’s Smartphone iOS or the Android smartphone devices. 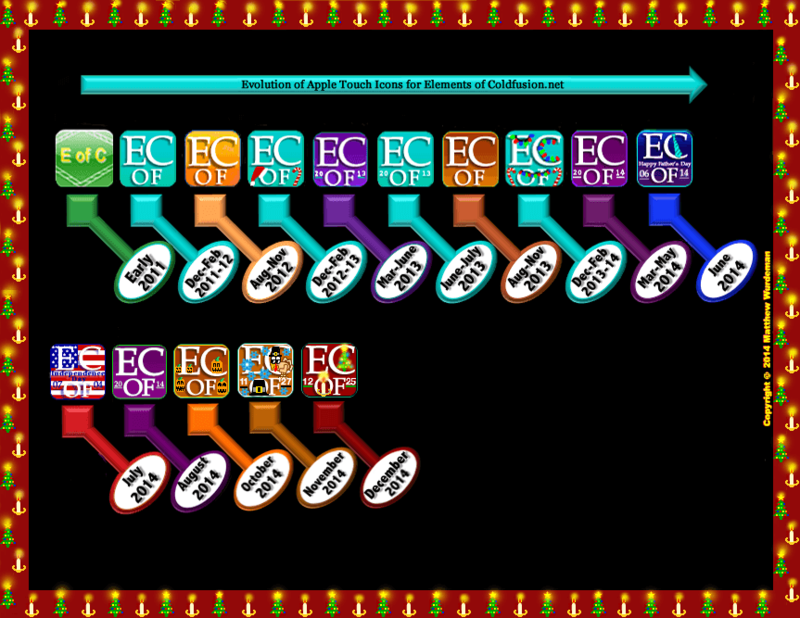 Timeline for “E of C” Apple Touch Icon design progression. Includes version to celebrate Father’s Day, 2014. Note: Please Click on the image of the timeline above to expand it. I decided to add a different background of blue and aqua colored stripes to match a design pattern of a men’s tie. 🙂 Just my own design style, of course. I am not speaking for all men. Please, use your best fashion judgement—heh. For Independence Day, I decided to add a new mobile formatted home screen icon to my design progression/evolution timeline that sticks with the American Flag and my “E of C” web site brand. Timeline for “E of C” Apple Touch Icon Homescreen Progression. Includes a special themed version to celebrate Independence Day, 2014. Note: Please, Click on the image of the timeline above to expand it. Since I changed the look and feel of my site to a more responsive design for tablet devices as well as for smartphones using a “snappier” theme, I decided to add a slightly different “Apple Touch” icon for my web site. So, when people want to add my bookmark to an iPhone homescreen, they will see a slight design tweak. 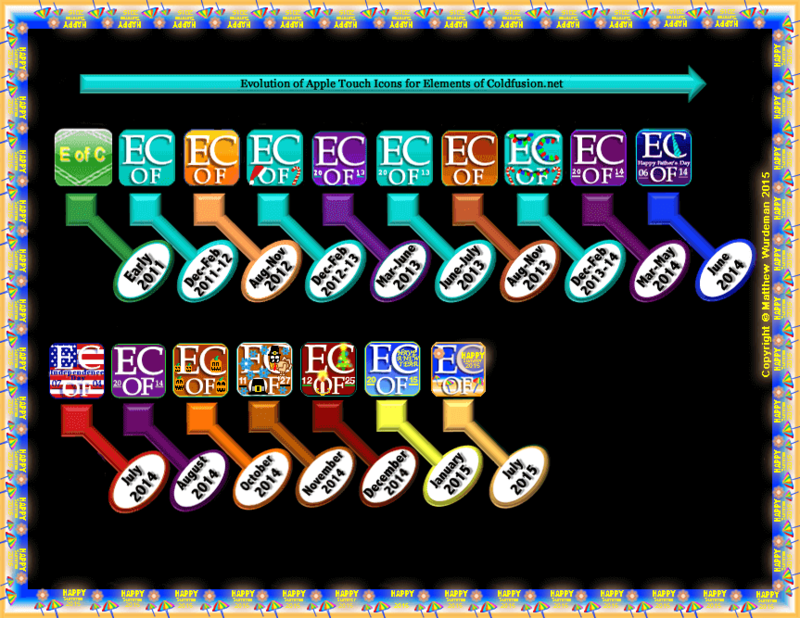 Timeline for “E of C” Apple Touch Icon design progression. 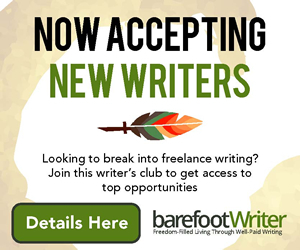 Includes a new addition and a design tweak to “E of C” bookmark icon on August 26, 2014. 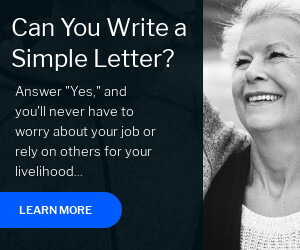 A slight neon green border is included along with a purple background with white colored font. For October, I decided to add a new mobile formatted home screen icon to my design progression/evolution timeline that sticks with a Pumpkin or Jack O’Lantern motif integrated into my “E of C” font and web site branding. Please feel free to add this snappy bookmark icon to your smartphone of choice! Timeline for “E of C” Apple Touch Home Screen Icon design progression. 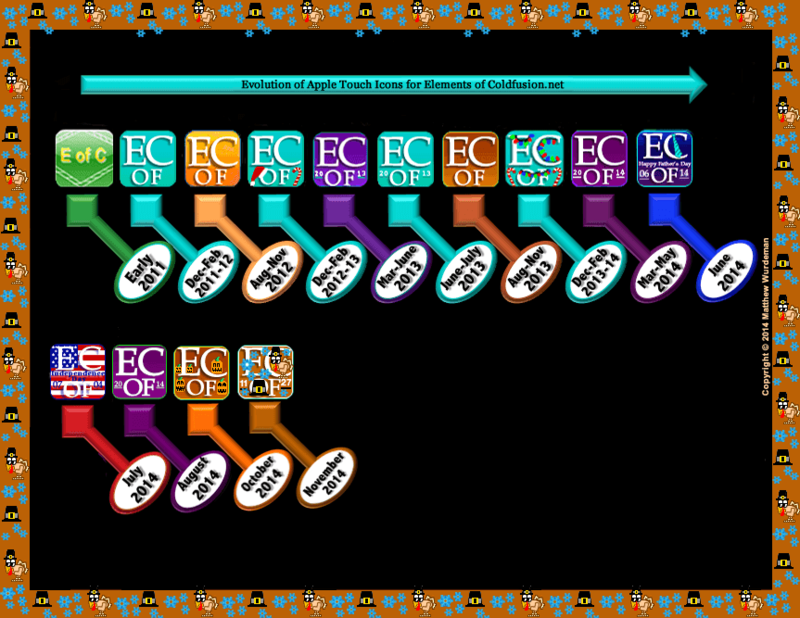 Includes new addition and design tweak to “E of C” Timeline on October 16, 2014. Slight Orange and Brown background with white colored font along with Pumpkins integrated into the scene. For Thanksgiving this year, I decided to add a new mobile formatted home screen icon to my design progression/evolution timeline that sticks with a Turkey and a Pilrim’s hat motif integrated into my “E of C” font and web site branding. I also added some blue snow flakes as kind of rememberance of the fact that cold and snowy weather is upon us — well, at least in the vicinity that I am living in here in the United Sates of America. Oh, please feel free to add this snappy bookmark icon to your smartphone’s homescreen if you like. Happy Thanksgiving! This Christmas, I decided to add a new mobile formatted home screen icon to my design progression/evolution timeline that sticks with a candle and a Christmas tree motif integrated into my “E of C” font and web site branding. I also added a darker red background color to the icon design along with the numbers 12 and 25 for the month (12) and day (25) that Christmas (U.S. Holiday observation) arrives on. Merry Christmas everyone!! Note: Click on the image of the timeline above to expand it. Please feel free to add this very “Merry” bookmark icon to your smartphone’s homescreen if you like. Happy Holidays! To get a fresh set of “365’s” or a new set of 365 days off to a nice and clean start in 2015 like a deck of playing cards, I decided to expand my Homescreen icon to express a “Snappy New Year” with a “Have a New Year” greeting. Since the bringing in of a New Year represents a celebration for a plethora of reasons, might as well make it gold with some brightness to boot with the snappy “Bold Bluescapes” of my fresh icon theme! For Summer, 2015, I thought that it would be pretty cool to add a new mobile formatted home screen icon to my design progression/evolution timeline that integrated a beach scene with umbrellas into my “E of C” font and web site branding style. I also added a tan, white and blue background combination to the icon design along with the phrase, “Happy Summer 2015.” Have a Happy Summer everyone!! For Saint Patrick’s Day this year (2016), I thought that it would be appropriate to add a newly designed, mobile formatted home screen icon to my design progression/evolution timeline. I took the four leaf clover approach for my “Apple Touch Icon” and web site branding style. 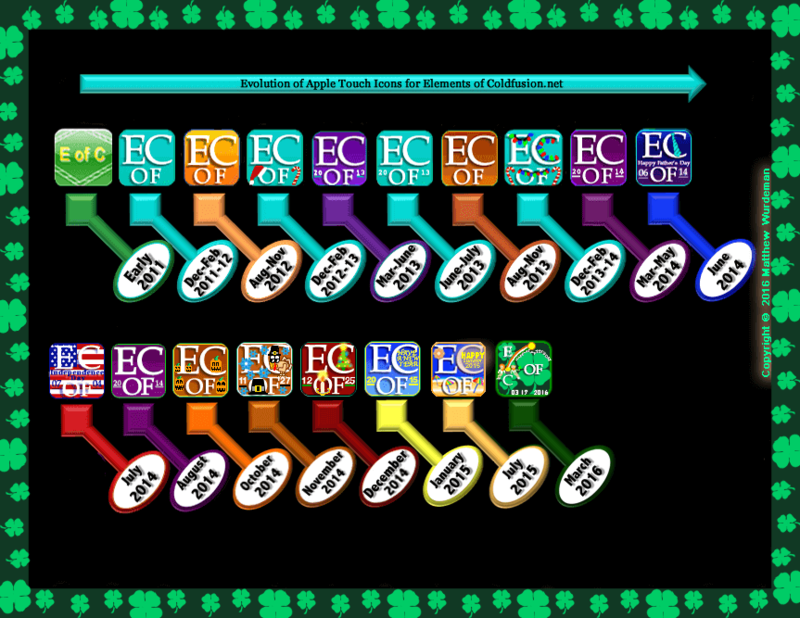 I also added a reference to E of C (Elements of Coldfusion) in there and a Happy St Patty’s Day. So, in the spirit of the Irish, Have a Happy Saint Patrick’s Day. 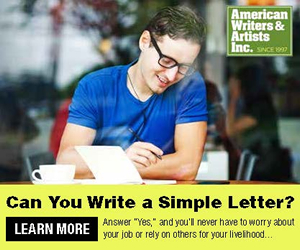 ***And as always, Thanks for “clicking in” to view my creative work! Click on the images above to view a full size version of my “Smartphone” Homescreen icon timeline. Enjoy! Legal Disclaimer: Apple iPhone and Apple Touch Icons are Registered Trademarks of Apple, Inc. All Rights Reserved.